I listed the top viewed posts of 2012, but thought I would post a list of my favorite posts of 2012 too. 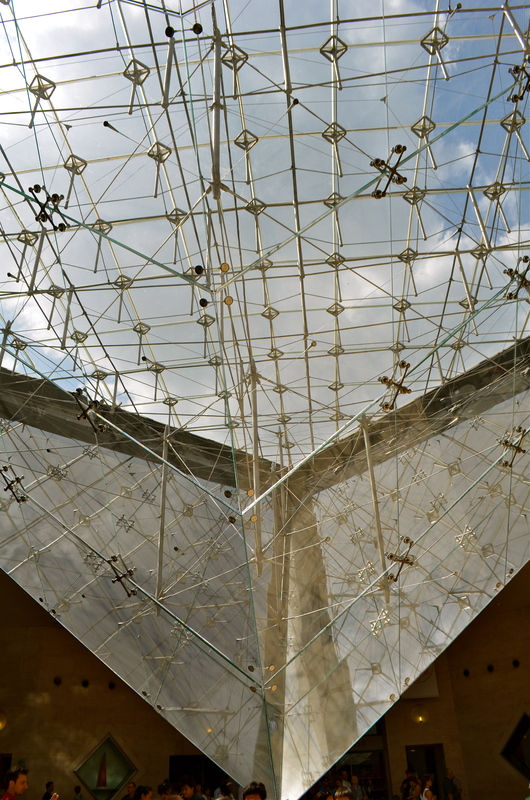 Duomo’s Rooftop, A Sculpture Garden In The Sky – I just like the pictures. Dubai’s River, It’s Other Waterfront – I liked how different Dubai was from Geneva and loved its mix of cultures. While you can see cool skyscrapers lots of places, there aren’t many where you can see the old wood dhows and the people from all over the world who trade on Dubai’s waterfront. Millennium Trilogy Walking Tour Of Stieg Larsson’s Stockholm – Part Two – I loved The Girl With the Dragon Tattoo, The Girl Who Played With Fire and The Girl Who Kicked the Hornet’s Nest (Men Who Hate Women in Swedish). When we went to Stockholm, I toured the sites mentioned in the books. Most of them were in the super-cool Sodermalm neighborhood. Mohawks Welcome But Not Required At The Groezrock Festival– We love live music and a European Music Festival is something to experience. This one had a great lineup and was well worth the resulting fatigue (better described as exhaustion). 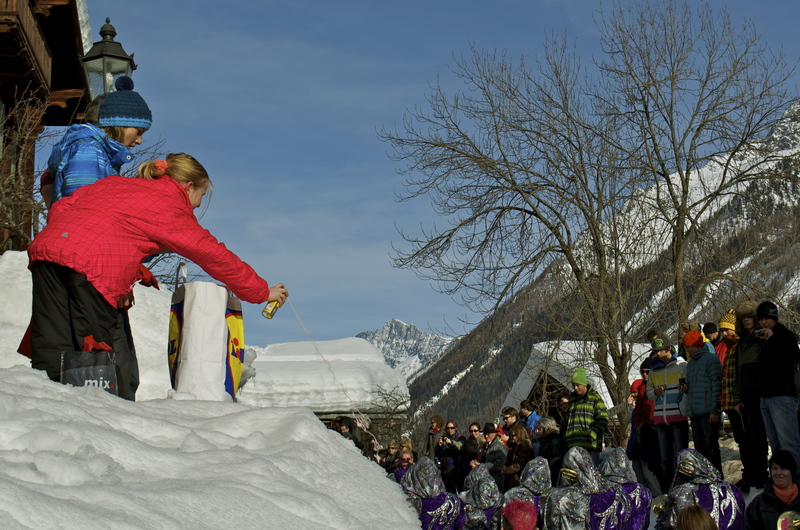 The Toblerone Line, One Sweet Barrier– We looked all over Switzerland for this puppy. Once we found it, we couldn’t stop seeing it places (Reichenbach Falls, near Thun, etc.). Why I Love Running– One of my favorite things. 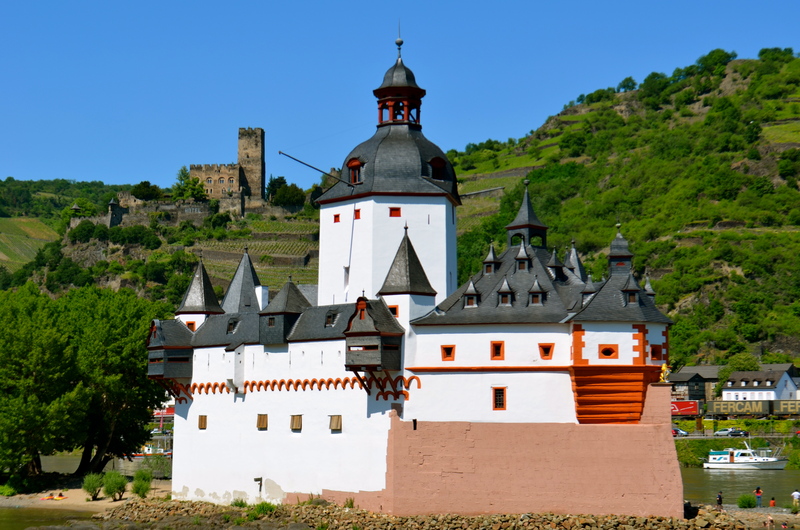 Weingut Otto Laubsenstein – Fantastic people + fantastic wine = unforgettable time. It Wasn’t Premeditated, Our Hike Up Rochers-de-Naye – A reader suggestion and one of the best views in Switzerland. If you’re not up for hours of hiking straight uphill, you can always take the train there. The Shock Of Your Life – Culture Shock – I tried to keep it real. Thank you Freshly Pressed for selecting the post (Everything You Don’t Need And Can’t Live Without) for Freshly Pressed. We left our families and friends to move over here and started the blog to share our lives and everything learned with them. It’s nice to know that someone other than my mom likes my pictures and is entertained. Thanks for checking it out. The Ides of March, (no, not the film) the fifteenth of March, is today. It is the day on which, in 44 B.C., a group of conspirators led by Brutus (et tu Brutue?) 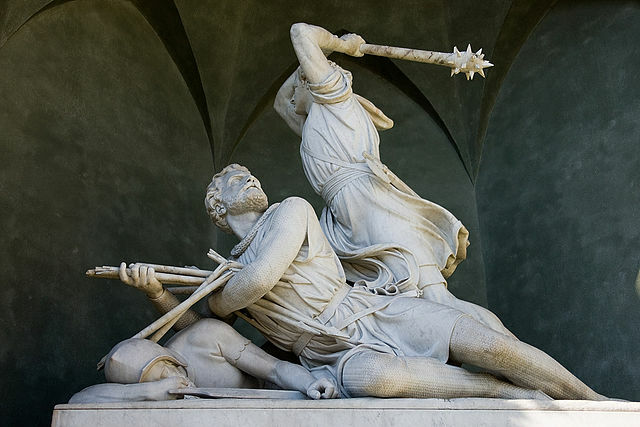 and Cassius stabbed Julius Caesar to death in the Roman Senate. It got me thinking about Rome’s legacy here in Switzerland. 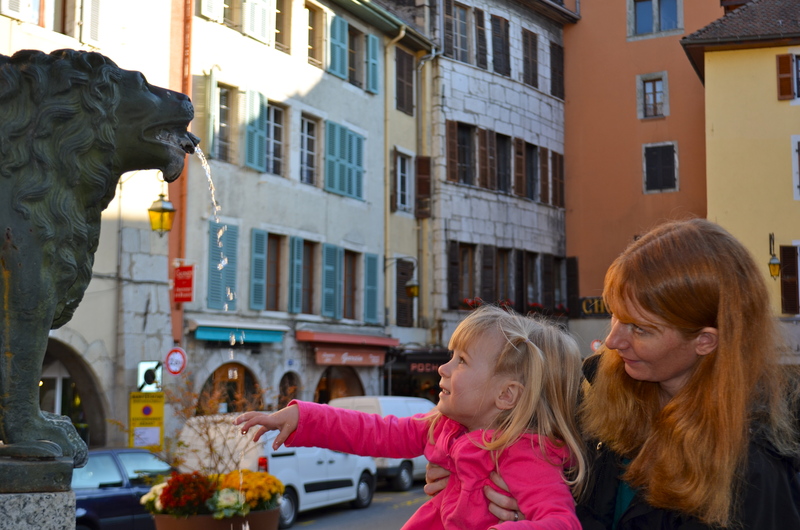 While evidence of Switzerland’s time under Roman rule is everywhere, I have a favorite part of their legacy, fountains. Rome came. Rome built fountains. Rome fell. The fountains remained. Who doesn’t like a fountain? 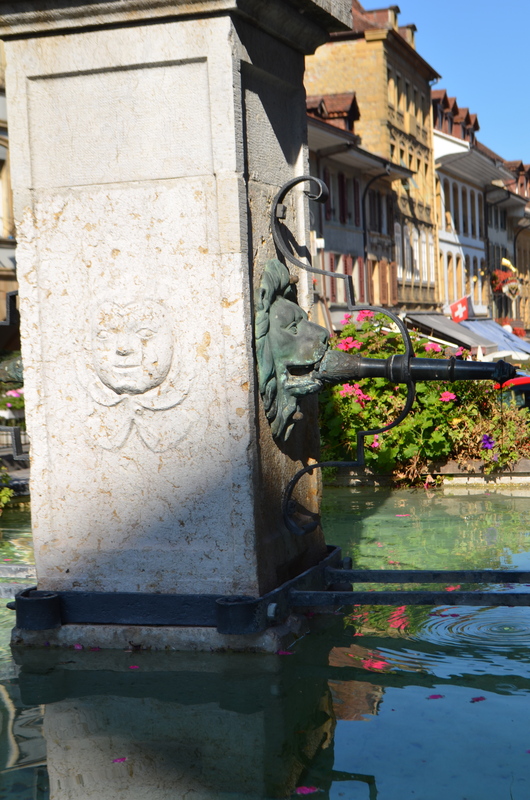 When people could figure out how to do it again, they tried making fountains like those cool old Roman ones. They did it in Switzerland, but all over Europe. Right on. When we hike in the summer, we can pretty much be sure that we will be able to get water from a fountain. The cows have to drink way up there, so you know they are going to have water. The caveat to this, and don’t mess this up or you will end up like us paying $12 a bottle, is that there are no fountains when you are up high enough. If cows can’t graze up there, they are going to build it. Period. 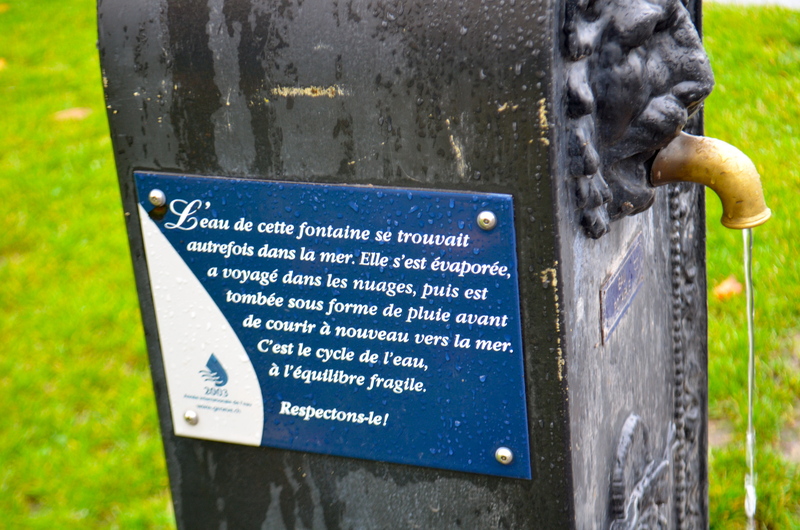 The water of this fountain once stood in the sea before it evaporated. It traveled in the clouds, and fell as rain before running again towards the sea. This is the water cycle has fragile balance. Respect it. 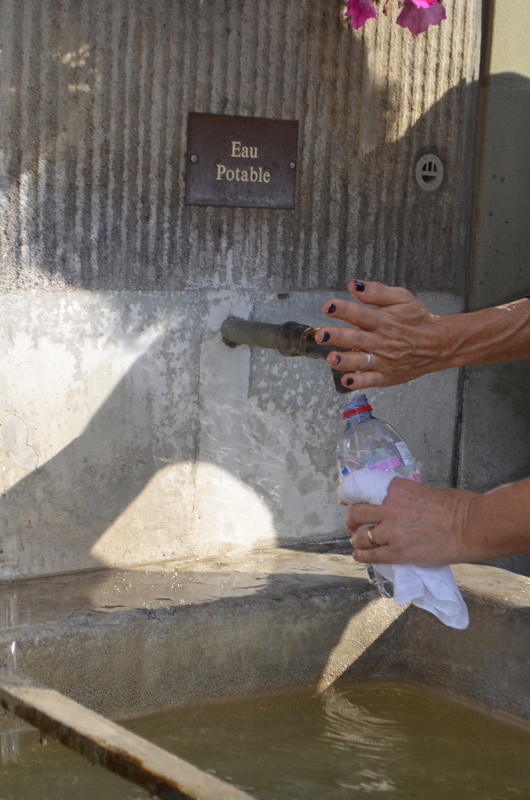 At almost every fountain, the water is drinkable. 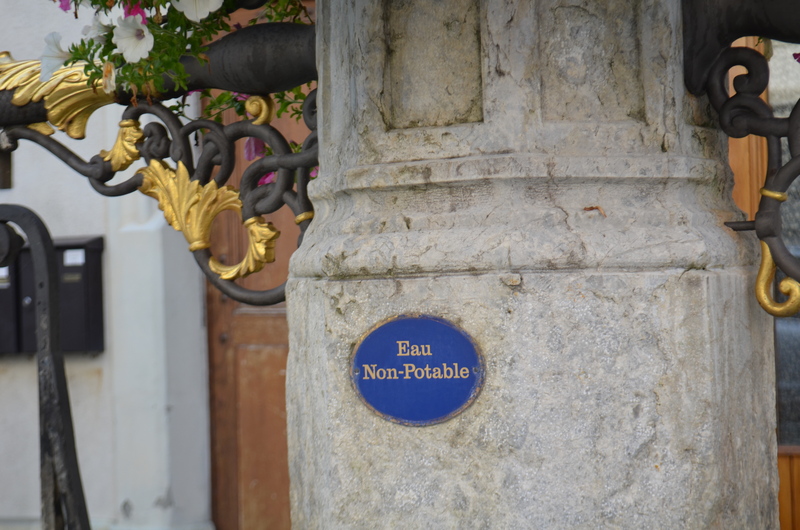 In Switzerland, if the water isn’t safe to drink, it will be marked with a sign that reads “Eau Non-Potable” or and “X” over a cup. You can stick your head under the fountain, like you would at a water fountain, or collect it in a bottle. I love not having to plan my water stops or carry water with me on long runs; the fountains are everywhere. 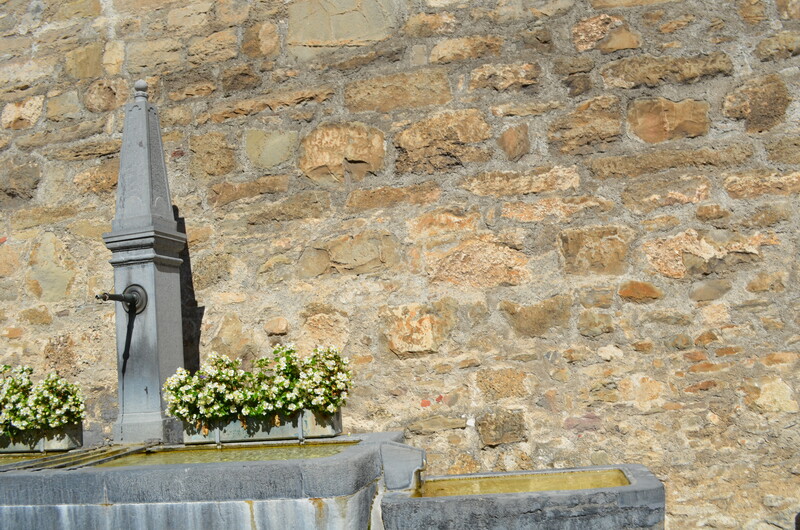 Sometimes, flowers decorate the fountains. This always make a great photo opportunity. Other times, the fountains themselves are decorative and/or commerative. 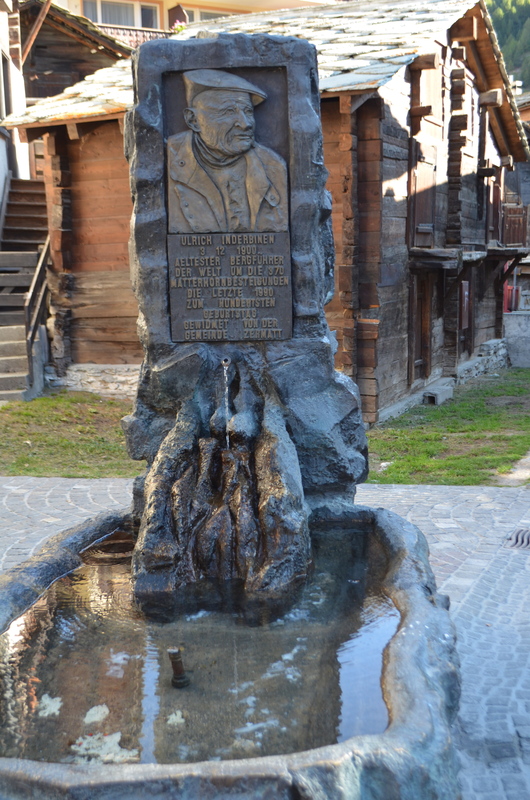 A fountain in memory of alpine guide Ulrich Inderbinen who summited the Matterhorn over 370 times, with his last ascent at the age of 90! 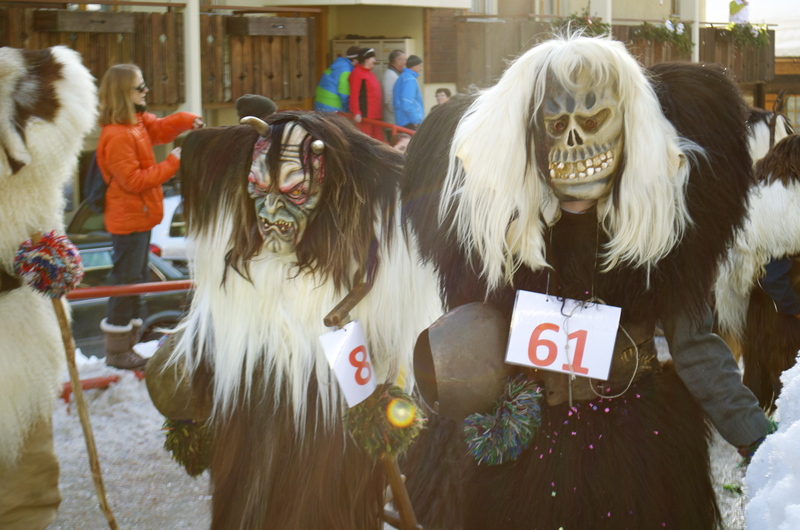 If you go to the the Lötschental Valley‘s Carnival parade in Wilder, Switzerland, be ready for Tschäggättä to surprise and scare you. 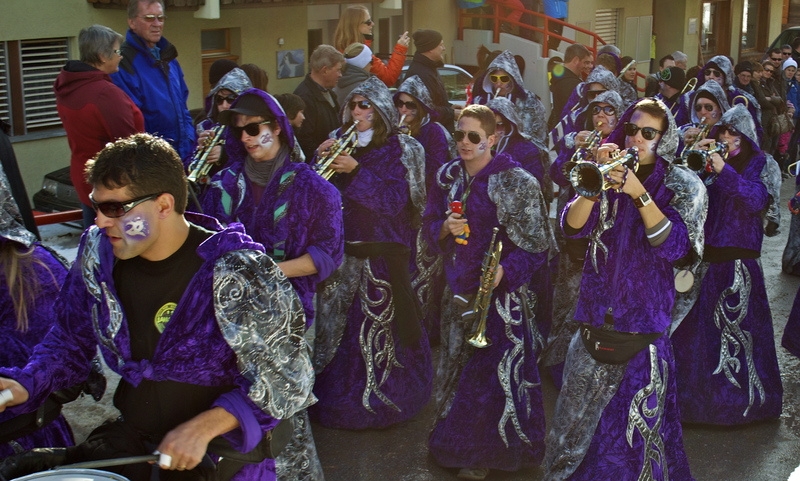 Tschäggättä roam the streets for days before and after the parades creating mischief and scaring unsuspecting victims. 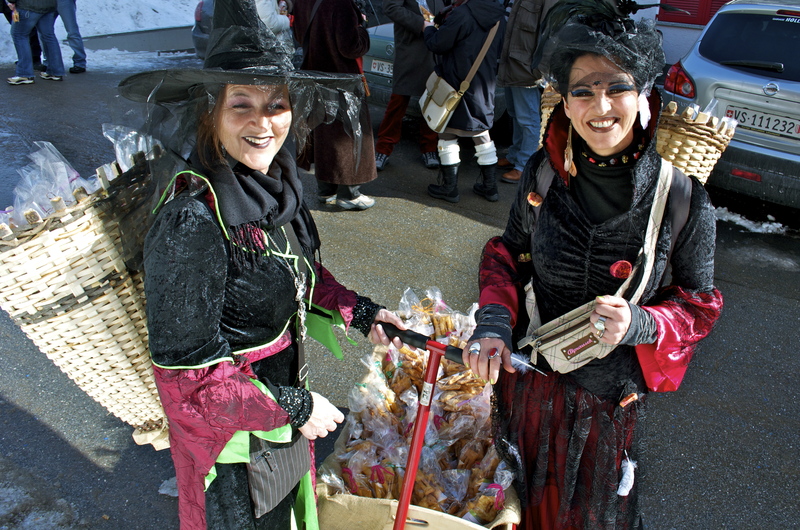 Witches sold the Lötschentaler Chiächlini, the traditional fatty, sugary Carnival/Fat Tuesday/Fat Thursday treat. 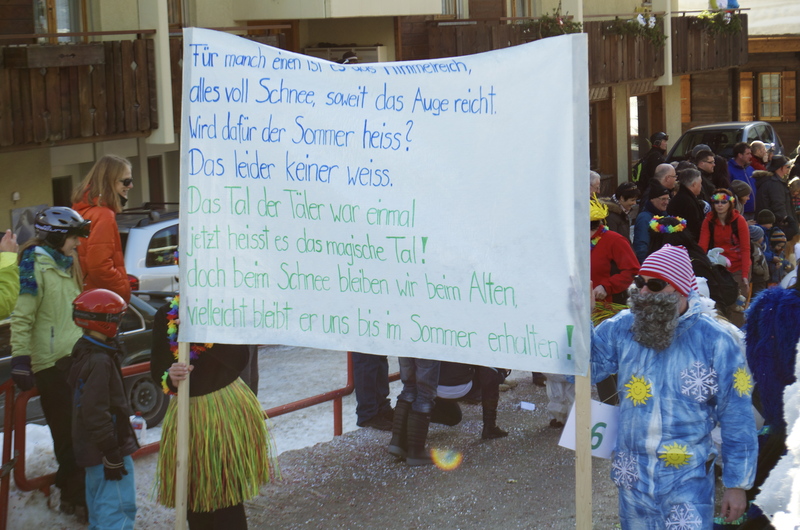 Although I couldn’t find any mention of Lötschentaler Chiächlini, I found this recipe for Swiss Carnival Cookies (Fasnachtsküchlein) that seems similar. They were good, a cross between a donut and a cookie. They would have been even better fresh out of the fryer. I wanted to dip mine in chocolate. 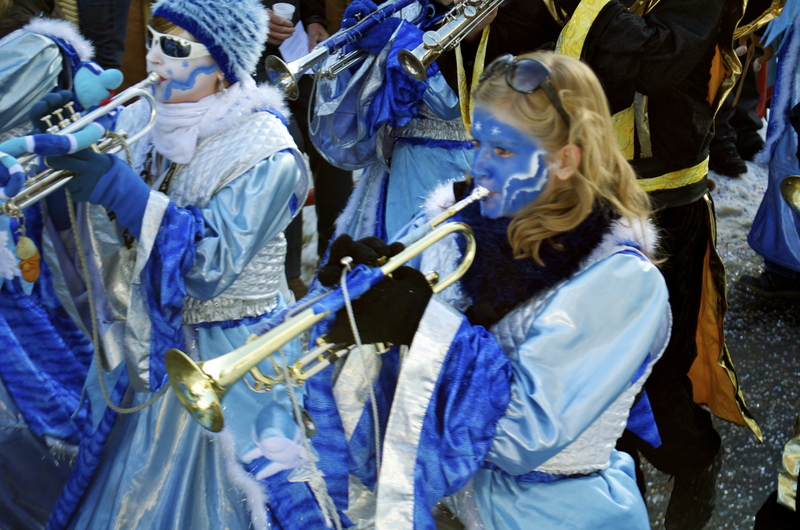 Lots of bands helped make the atmosphere festive. They played everything from versions of Metallica, Bon Jovi and Kiss to Lady Gaga. It was easy to pick out the foreigners because they were they ones dancing like idiots to the music. It must have been a long day for the marching bands and at over a mile in altitude, it was important for them to stay hydrated. 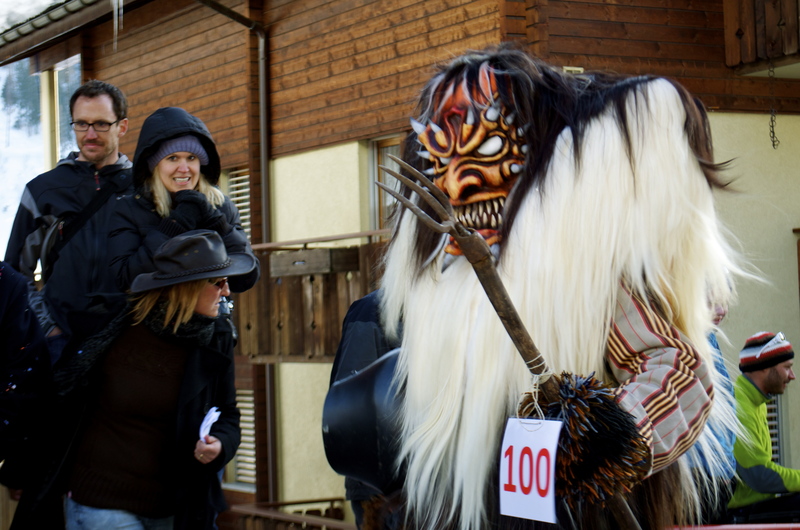 Although Tschäggättä were everywhere, there was much more to the parade. 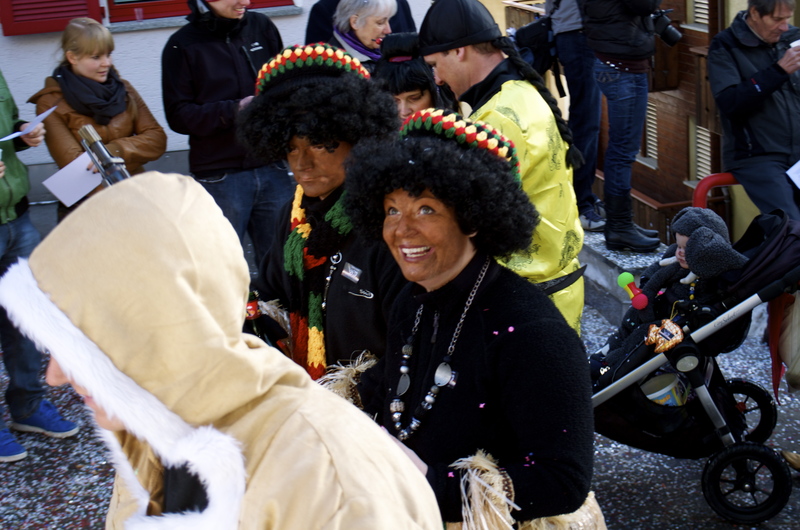 People of all ages took part and even the smaller participants wore costumes. 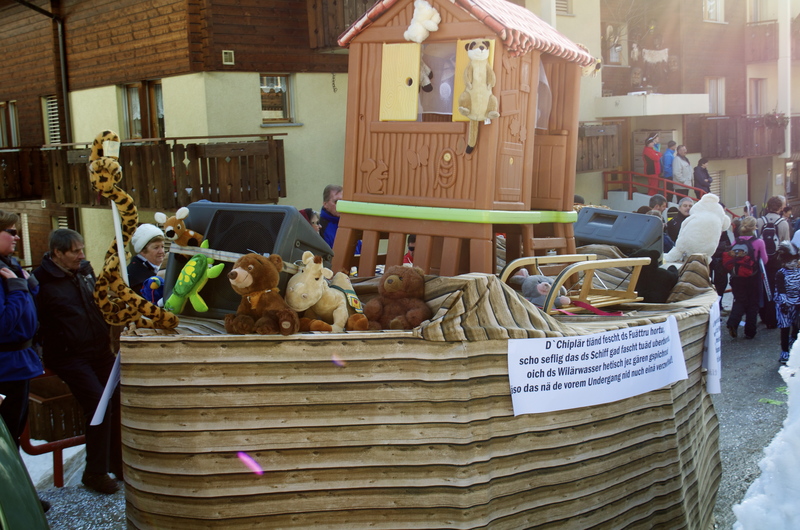 Many of the floats appeared to have a political bent. 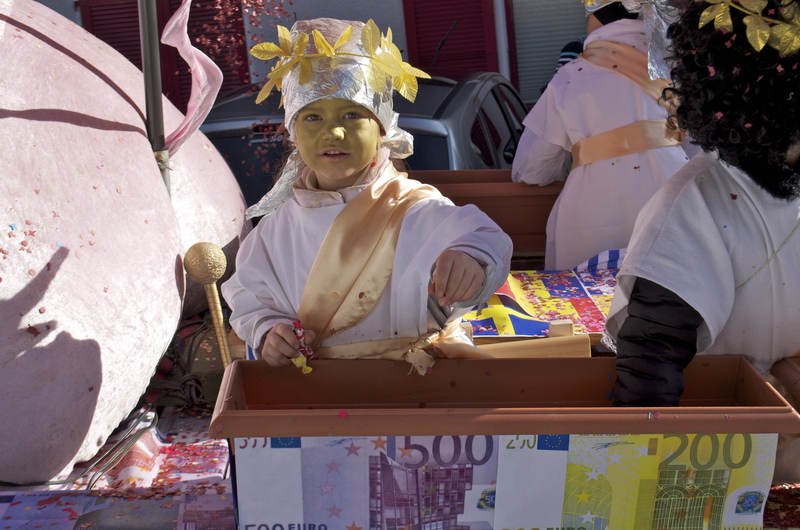 This one seemed to compare the value of the Euro to that of shredded paper or confetti. 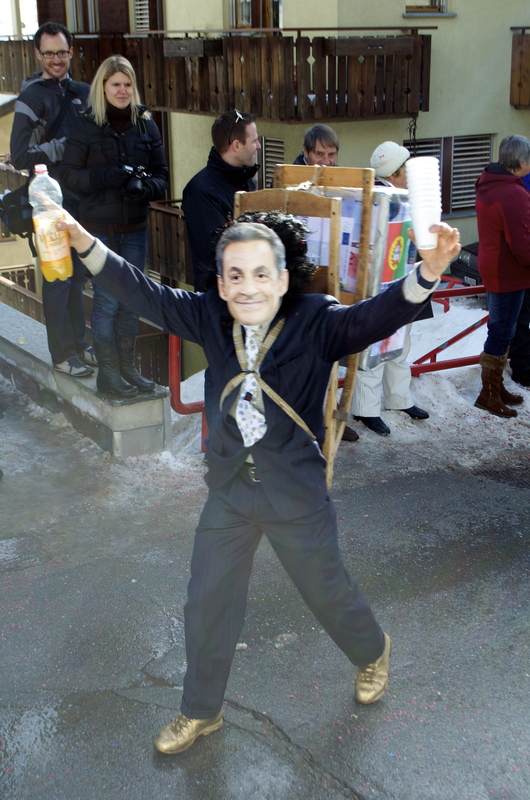 Sarkozy is always present for discussions on the Euro. He didn’t talk much though as he was passing out tasty beverages. 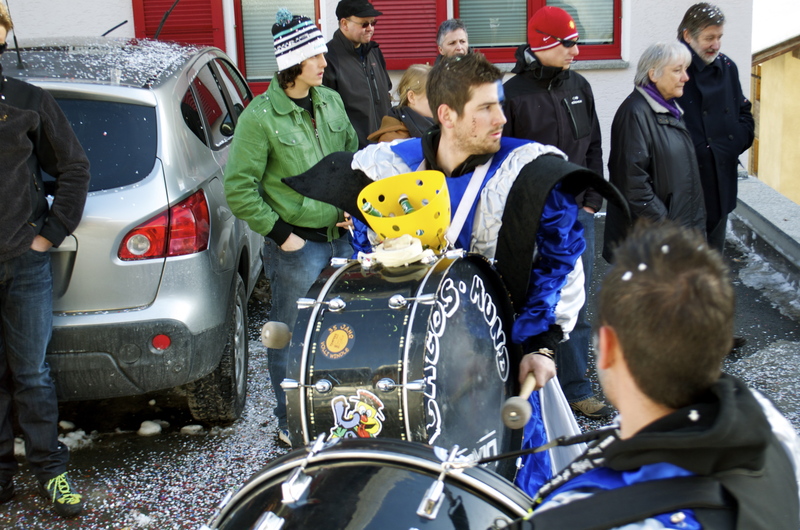 Traditionally, Tschäggättä were only the villages unmarried men. 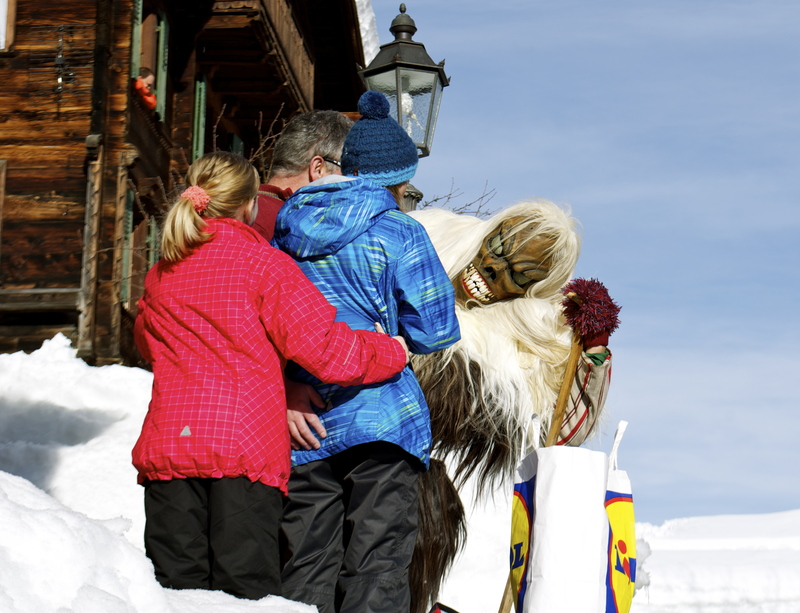 Although there is no way of knowing who (or what) is under the furs and masks, Tschäggättä has reportedly expanded to married men and children. These spooky figures were all women. Their eeriness appeared better suited for haunting than mischief-making. Both participants and onlookers had a jolly good time. Maybe some people were having a bit too much fun. 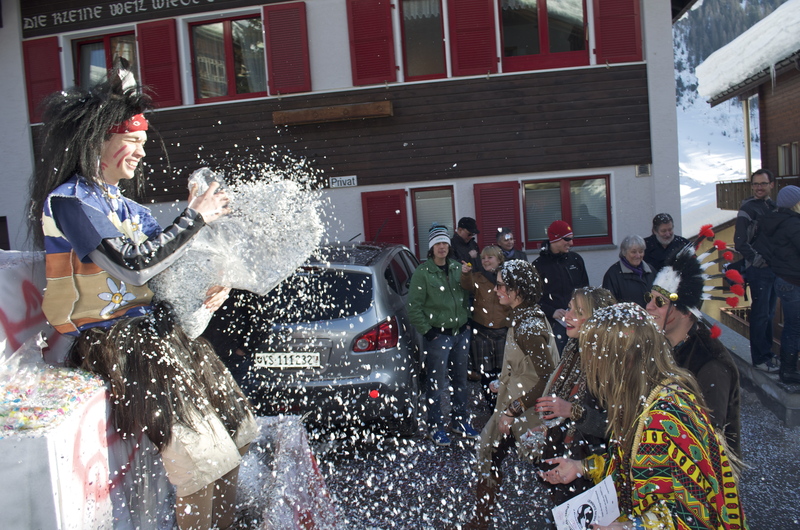 This costumed observer was scolded by an older Swiss gentleman for kicking snow. Über Swiss. Costumed characters on floats tossed confetti, blew bubbles, sang and handed out drinks, cookies and candy. 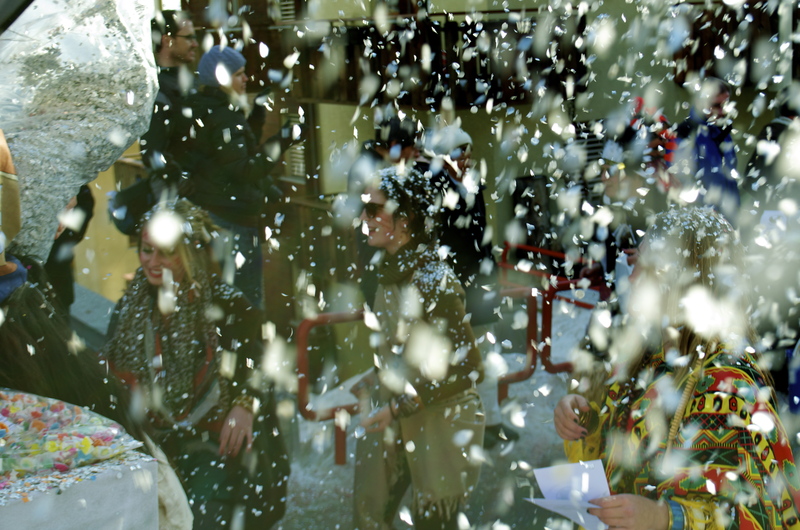 I got into the fun by scooping up confetti during a lull in the action and tossing it on our unsuspecting friends. Luckily, I was able to scoop up my wallet that went flying. I wasn’t the only one horsing around. These little observers came prepared with silly string to spray on the parade’s participants. This group chose global warming as their theme. 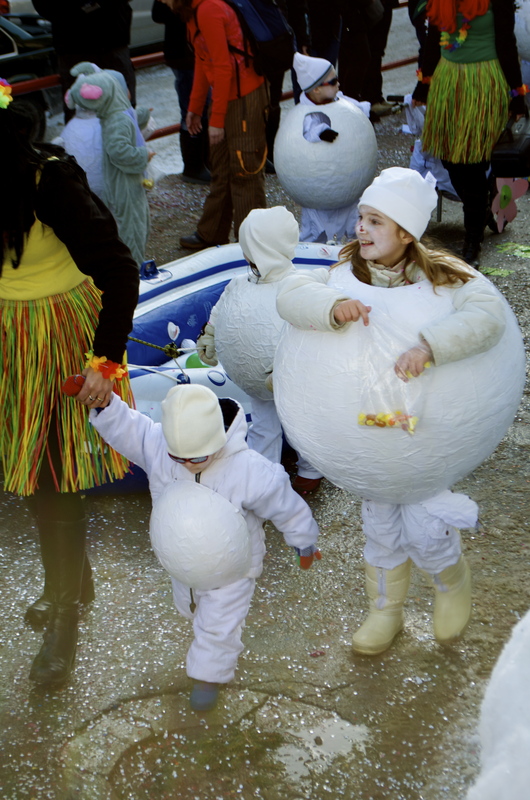 The tiny children dressed up as snow balls were adorable and seemed to be enjoying themselves. The arc needed some minor repairs right in front of us. We assisted by holding their large bottles of Sangria. They rewarded us with some. 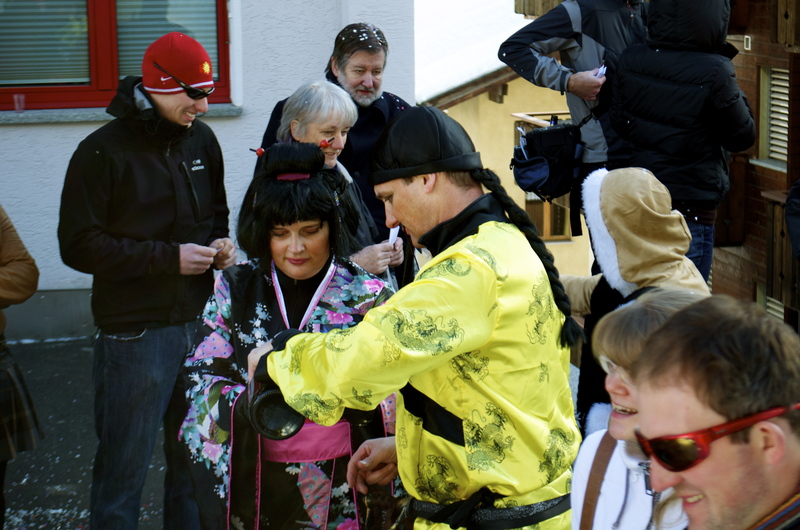 The costumes were an example of cultural differences. I don’t know if we would see such painted faces or Fu Manshus in the United States. The parade finished with a procession of over 100 Tschäggättä! 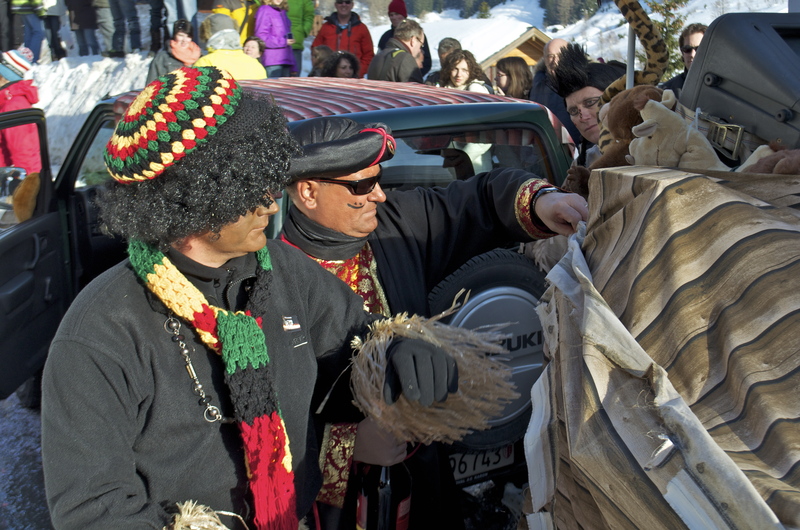 Sometimes, Carnival celebrations aren’t appropriate for children of families. Tschäggättä managed to have something for everyone and still be tons of fun. 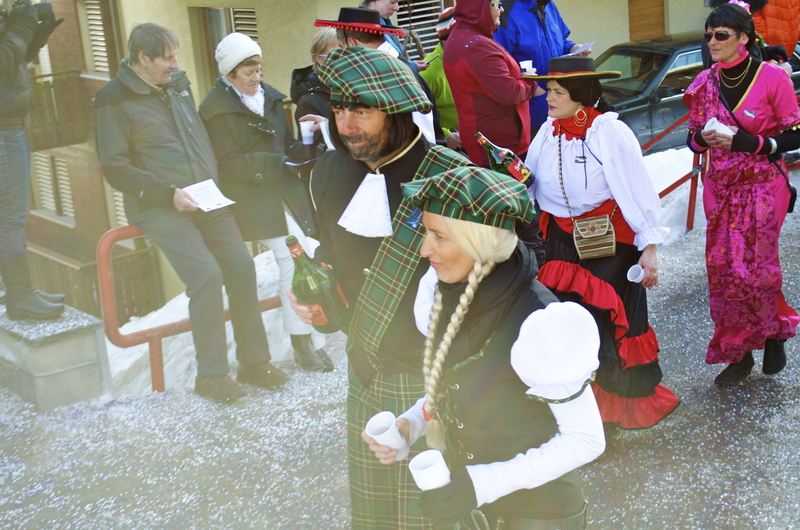 The atmosphere was playful, cheery and festive. Everyone from young to old made merry in a ridiculously beautiful setting. 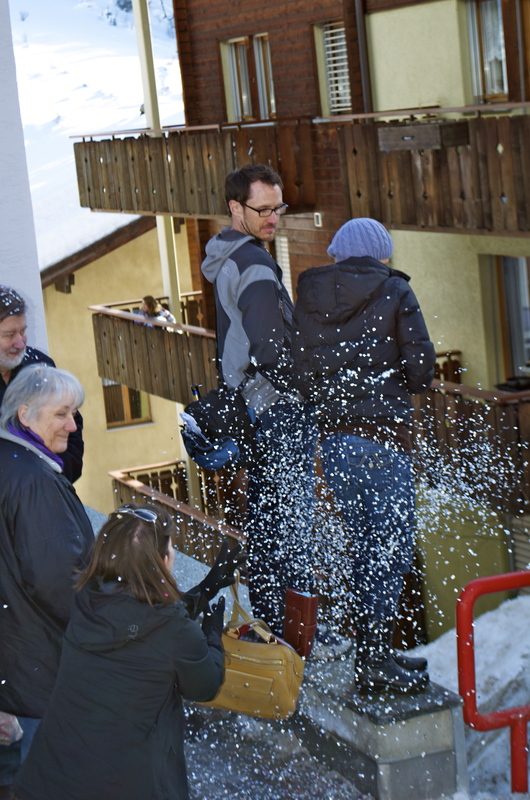 Last weekend, I met some friends from Belgium in Crans Montana, Switzerland. They were lucky enough to vacation there for a week and I crashed with them for a couple of nights. Their apartment had an insane view. I can’t imagine waking up to a sunrise over mountains like this every morning. 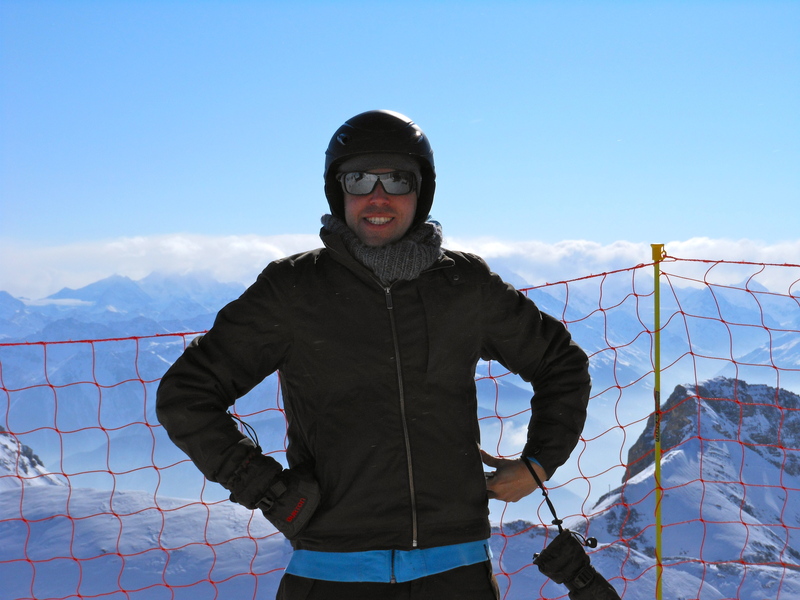 Although I’ve been to Swiss ski towns (Grindelwald, Zermatt) and skied in France (Contaimines, Clusaz) and Italy (Courmayeur), it was my first time skiing (and renting skis) in Switzerland. Typically, it runs about 18 Euros ($24). 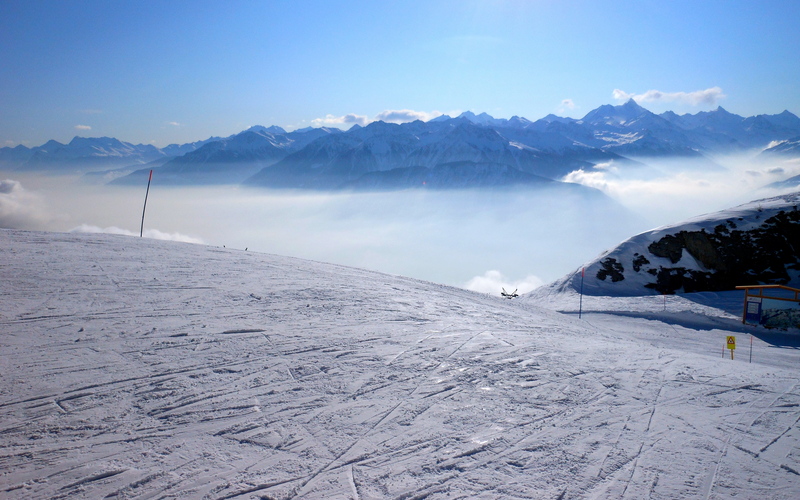 When I rented skis at Crans Montana, I gasped at the price. It was 64 CHF ($69) for one day! You would think that I would be used to Swiss prices by now. They haven’t lost their ability to shock me. 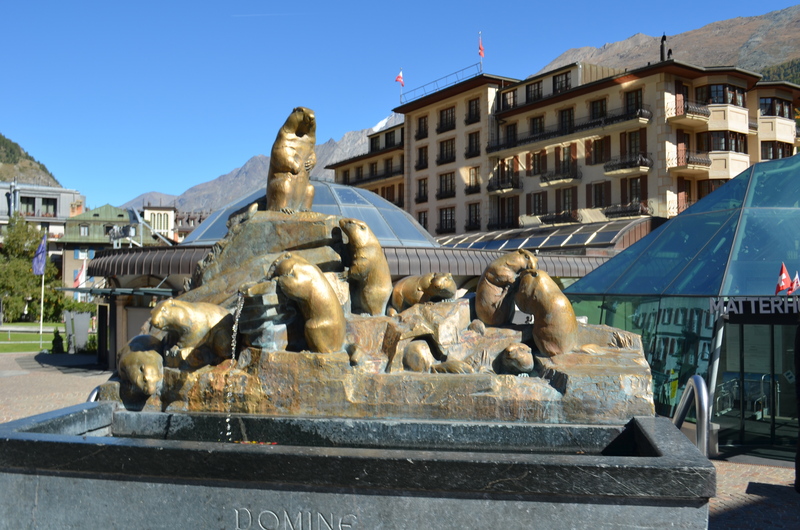 I guess I should have expected it, Crans Montana is a tony town where wealthy Russians, private bankers and the occasional celebrity (Roger Moore, the Sarkozys, Celine Dion, Princess Caroline) congregate. 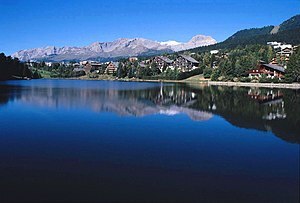 In addition to skiing, it is known for its golf course (redesigned in 1999 by Seve Ballesteros), meeting facilities and hotel school. 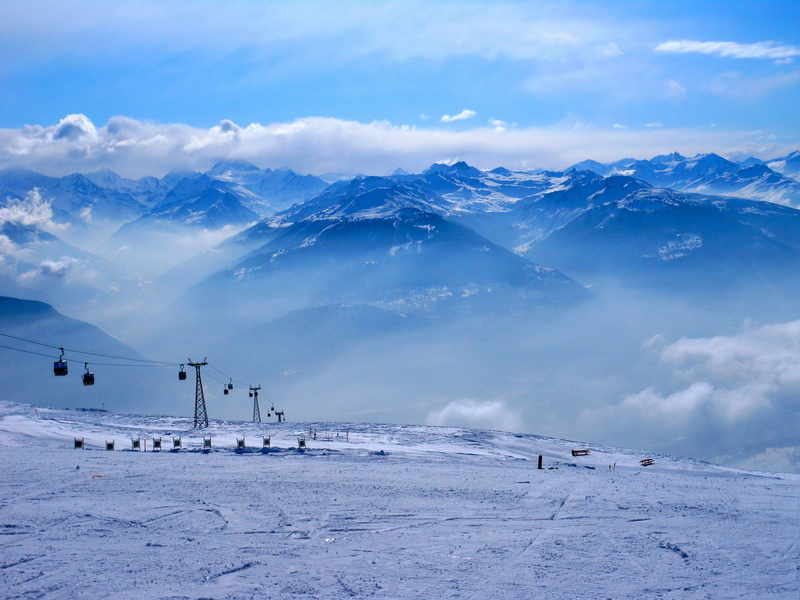 Crans Montana is on the north side of the valley in the Valais region of Switzerland, the sunniest part in all of Switzerland. 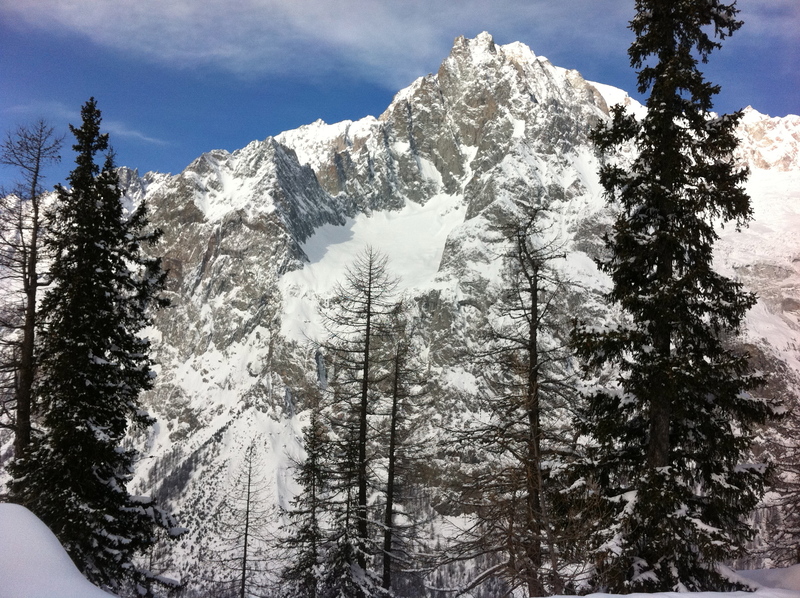 It was a glorious sunny day, with plenty of snow and stunning views of the Swiss Alps on the other side of the valley. 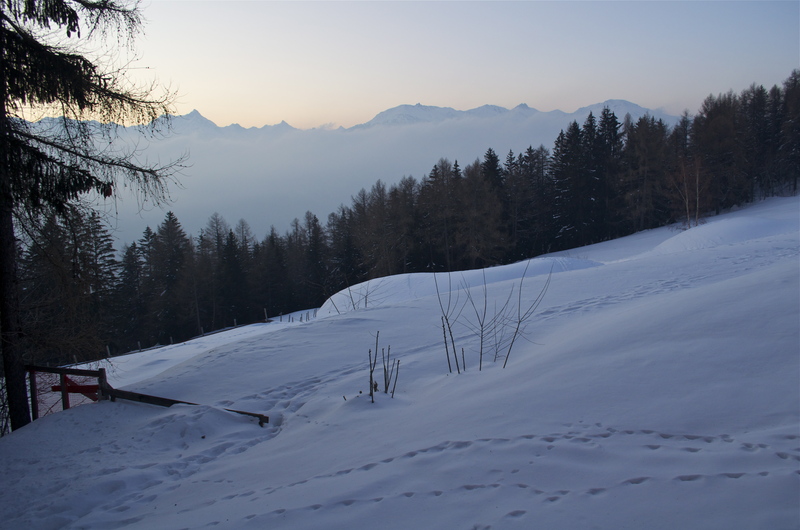 It’s snowed in Geneva, but the mountains have received even more of it. The snow report: lots of it. These guys were brave enough to go off piste and look good doing it. Seriously, they were hopping around like little bunnies. 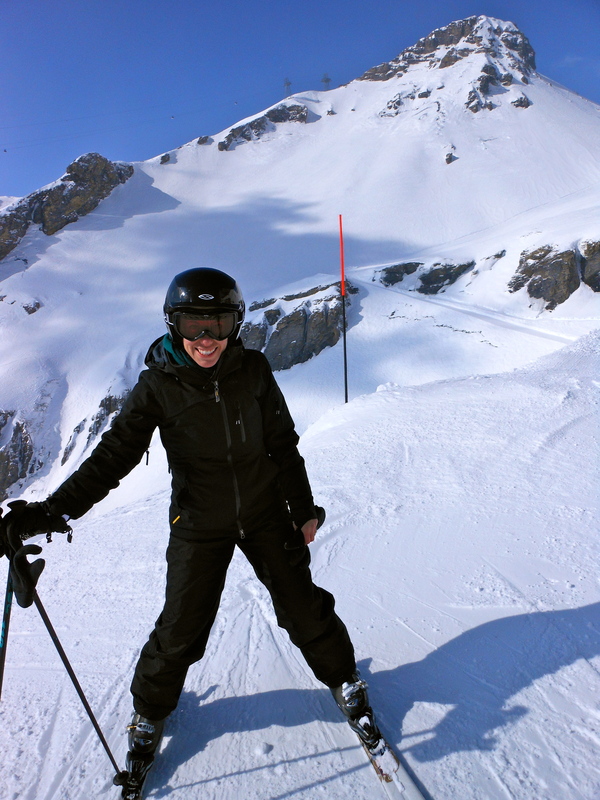 I was just happy to just not fall (on piste) and embarrass myself even more than I did. Once again, I was (by far) the worst skier in the group. Thankfully, everyone was very patient and encouraging. 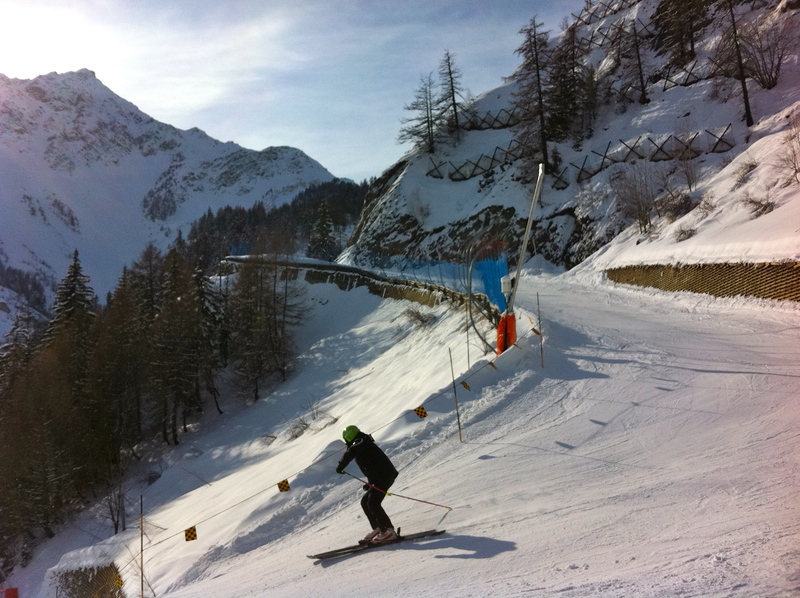 I gathered my courage and tried a black run for the first time over here. The good news is that it was tons of fun and I made it down in one piece. The bad news is that I was incredibly slow and slid about 40 feet down on my back, head first). On second thought, that panda doesn’t look sufficiently panicked. He looks like he is enjoying himself and isn’t worried about the possibility of death or serious injury. Good thing I wear a helmet. 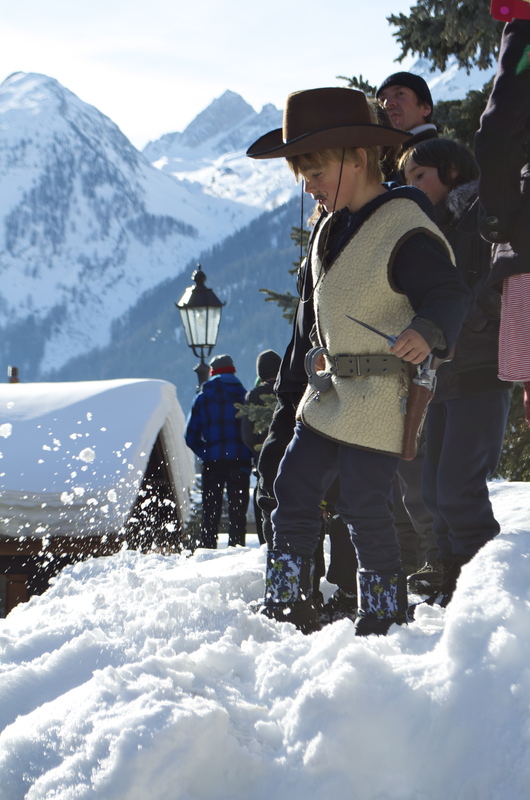 Once upon a time, Austria (the Hapsburg Empire) attempted to conquer the Swiss and marched into the mountains. 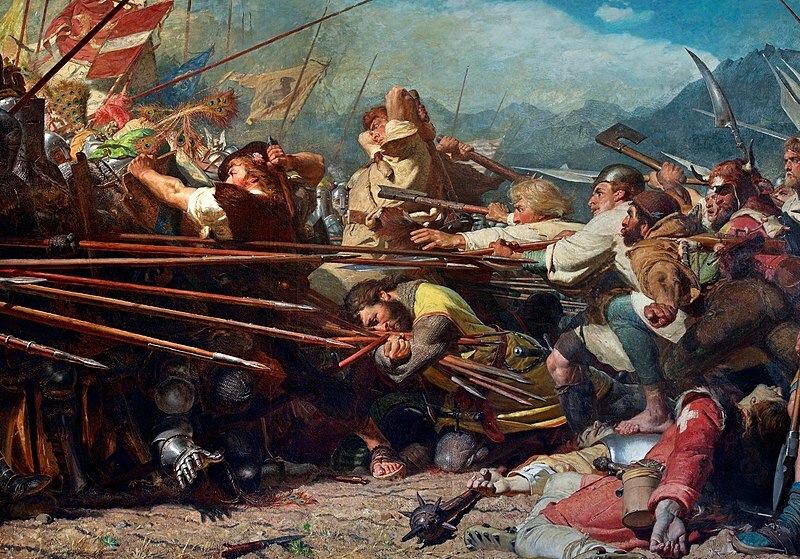 On July 9, 1386, they lined up to do battle with the Swiss at Sempach. 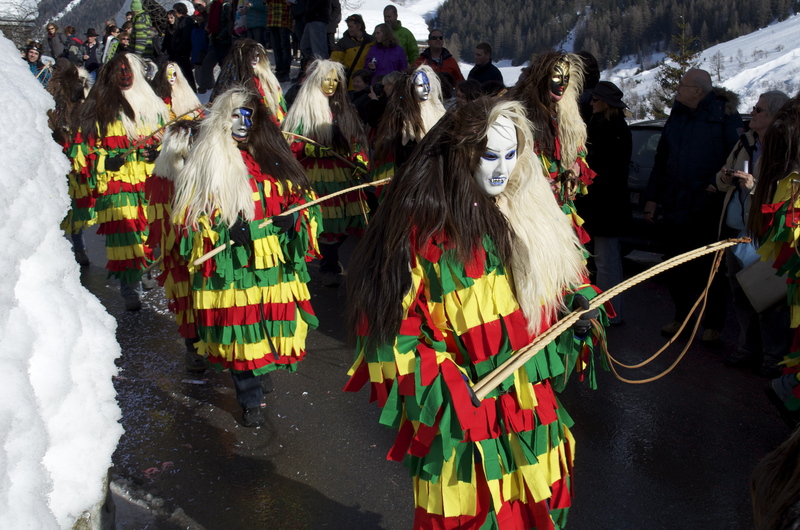 The Swiss mountain men were outmanned and had inferior weapons. For once, obsessions with having the longer spear paid off. 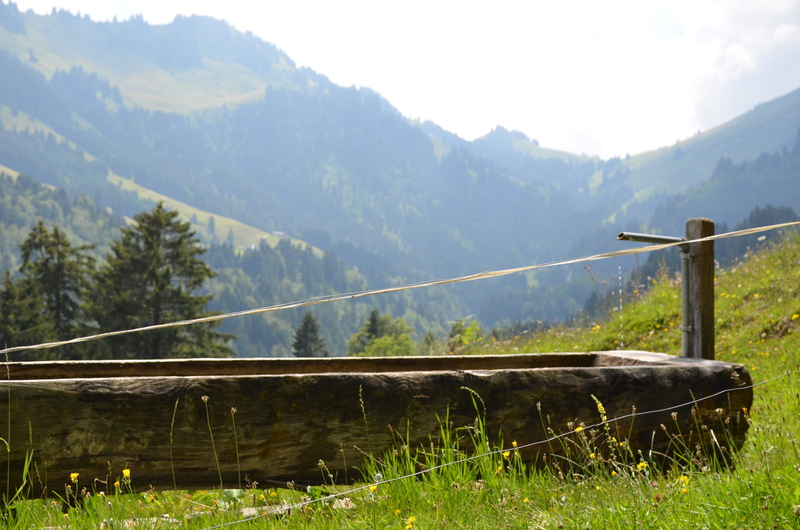 The Austrian’s pre-firearm spears were significantly longer than the Swiss’s short spears. This made it impossible to effectively attack the Austrians and break their line. Needless to say, the Swiss were not faring well and the outlook was bleak. 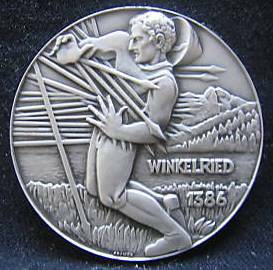 The soon to be legendary Arnold von Winkelried, knew that the Swiss would soon be defeated unless they made an opening in the Austrian’s line. Bravely, he extended his arms as far as possible, rushed toward the Austrian line and gathered as many spears as he could grasp in his arms. Legend says that he shouted, “take care of my wife and children” as he moved forward. It was either that or “who the heck pushed me”? 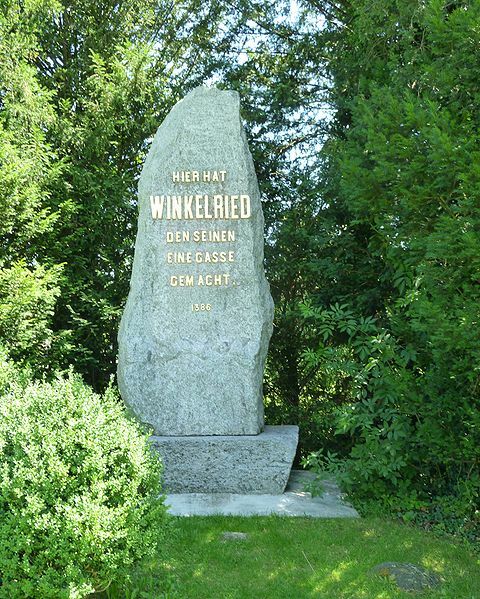 His legend is an important part of Swiss history and it isn’t difficult to find memorials to his bravery. 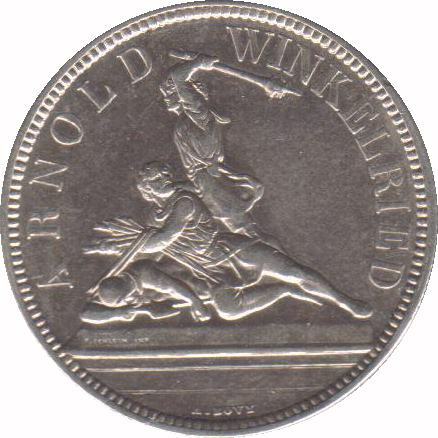 Five Francs ($6) is too small to be a bill here, it is now a coin. Geneva is a private banking hub and one of Europe’s wealthiest cities. Crime is not punished as harshly in Switzerland as it is in France (which surrounds Geneva), particularly if it is an offender’s first time. Although not mentioned in the article, most of Switzerland’s prisoners are foreigners. Preventative detention is not permitted in Switzerland. 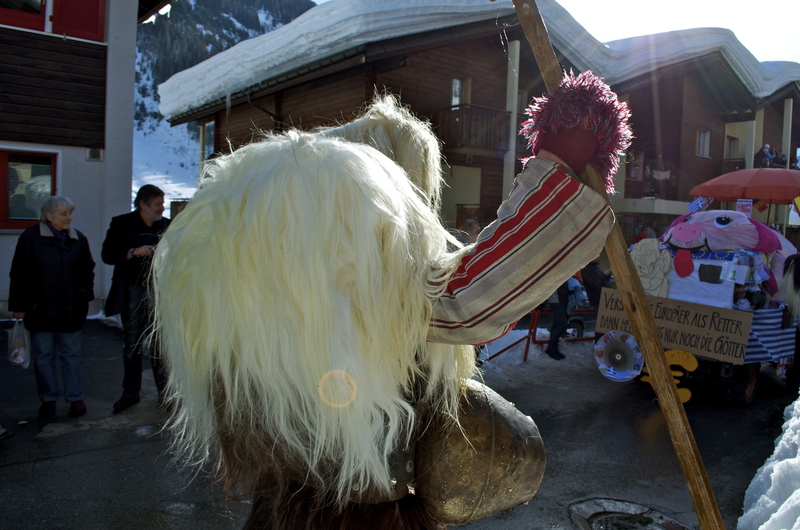 French gangs are now venturing in to Switzerland in search of greener pastures. Geneva has a lot to secure, from international organizations, to a rapidly growing city, to private banks. It requested funding for 200 more officers. Locals have complained about the deteriorating security situation ever since the Schengen Agreement opened Switzerland’s borders to much of Europe. In December 2008, Switzerland (even though it is not part of the European Union) became part of Schengen, a zone offering unrestricted travel to Europe. In Schengen areas, borders are open. There are no more passport checks entering countries or at borders (even though there are police checks at borders or checks for trafficked goods). On a side note, don’t get caught bringing a bunch bargain French meat into Switzerland. 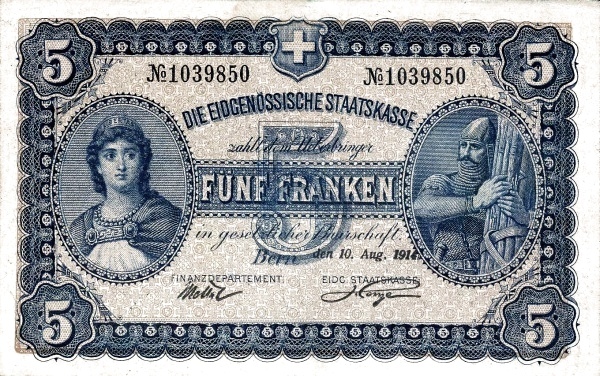 The Swiss, who love a fine, will make you pay. Before our move, people warned us of the problems with break-ins. We forked over a ton of CHF‘s to get this. It bolts the door into the door frame. We also got an additional top lock. To get into our apartment in Geneva, you pretty much need to do this. All of the buildings here have these too. Our code changed once already because of an attempted break-in. Our neighbor’s bar stopped the thieves, but it was so badly damaged that they had to call a locksmith to let them in. After having lived in Detroit, I keep track of my stuff, don’t leave anything out, lock all of my many locks and don’t worry. Mom and Dad, you don’t need to worry about either. Despite the rise in reported crime, Geneva is still the sixth safest city in the world. Mt. 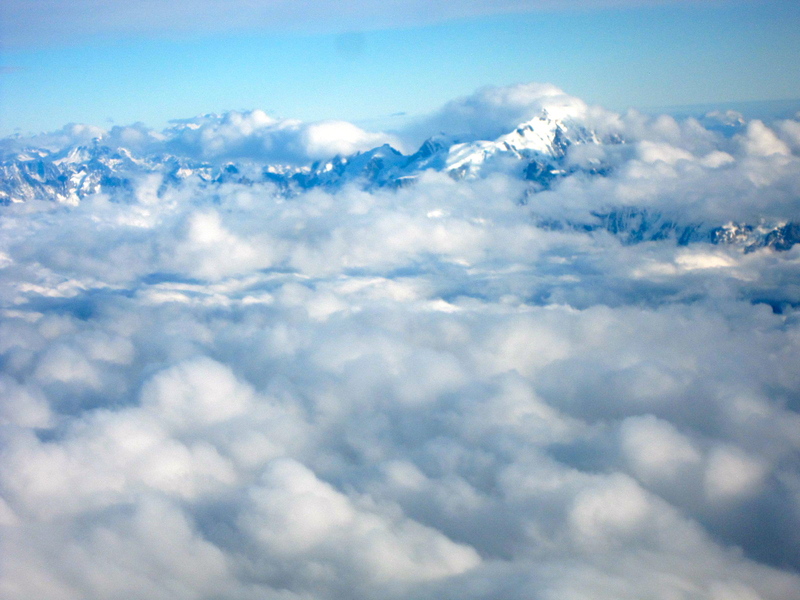 Blanc, Mont Blanc and Monte Bianco all refer to the same mountain. It has so many names because of its strategic location. 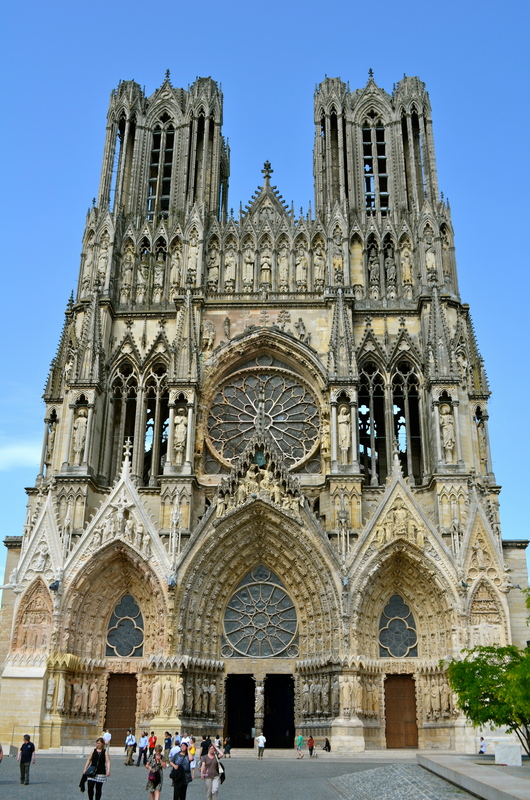 It in France, viewable from Switzerland and forms part of the border with Italy. 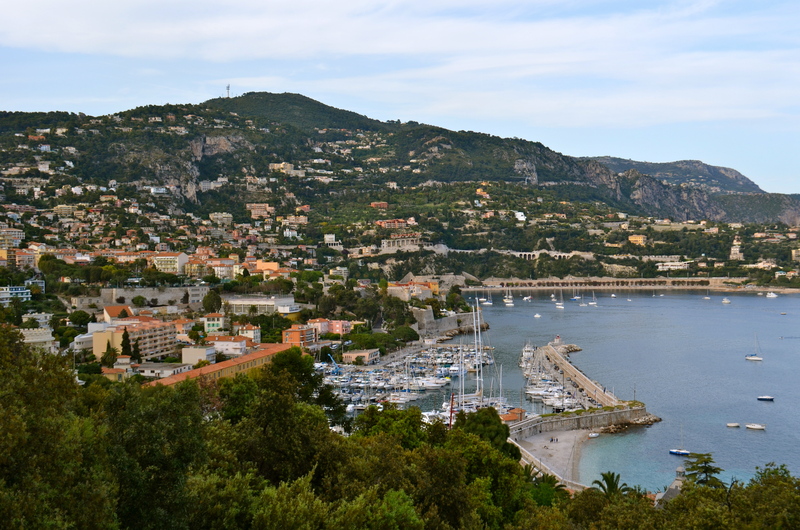 The French and Italian names mean “white mountain.” Other names for it include La Dame Blance and Il Bianco. 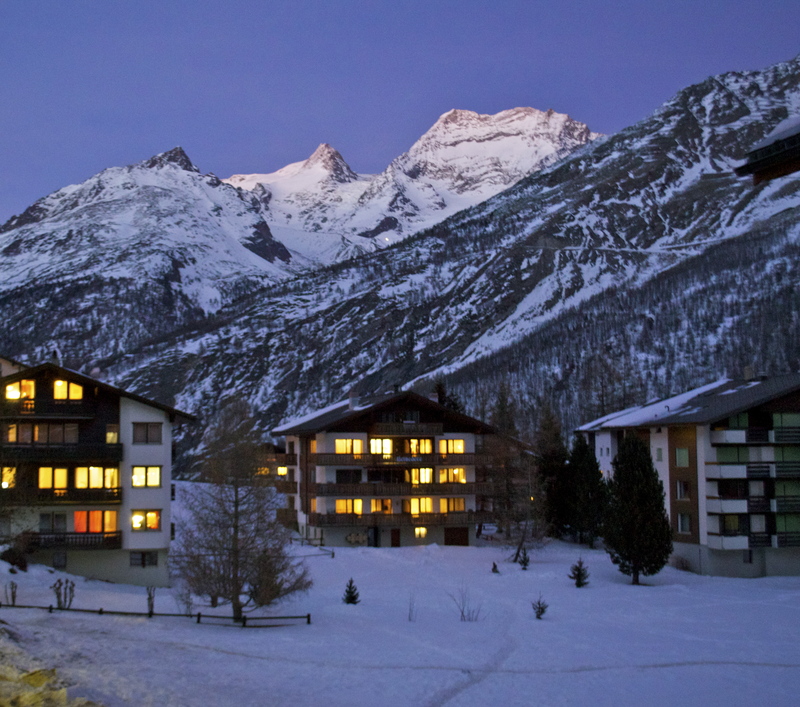 It lies in the Alps between Italy’s Aosta Valley and the Haute-Savoie region of France . The 11.6 km (7.1 mile) Mt. Blanc Tunnel has connected the two since it was built in 1965. The trip around the alps is long and so the tunnel was an instant success, becoming one of the major trans-alp transport routes. It costs about $60 roundtrip for a car to use the tunnel. That does not include the fine you will pay if you speed over 70 km/hr or do not leave sufficient distance between you and the car in front of you. They are militant about this safe driving because in 1999 there was a fire in the tunnel that killed 39 people. We felt a bit more at ease traveling through the tunnel knowing that when the tunnel reopened in 2002, it contained additional safety features. Mt. 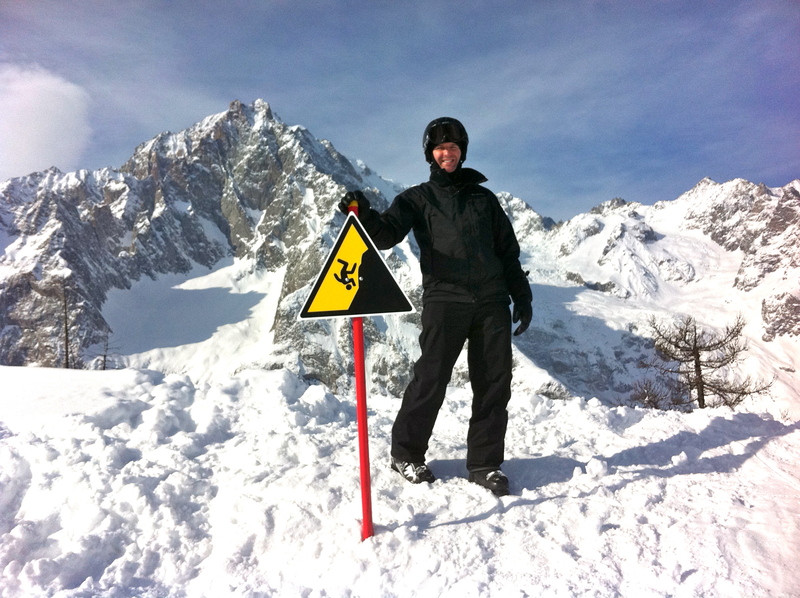 Blanc’s height is 4,810 m (15, 782 feet) tall. It has year-round snow. Its Bossons glacier comprises the largest ice fall in Europe. It made the news in 2007, when it grew 6 meters! 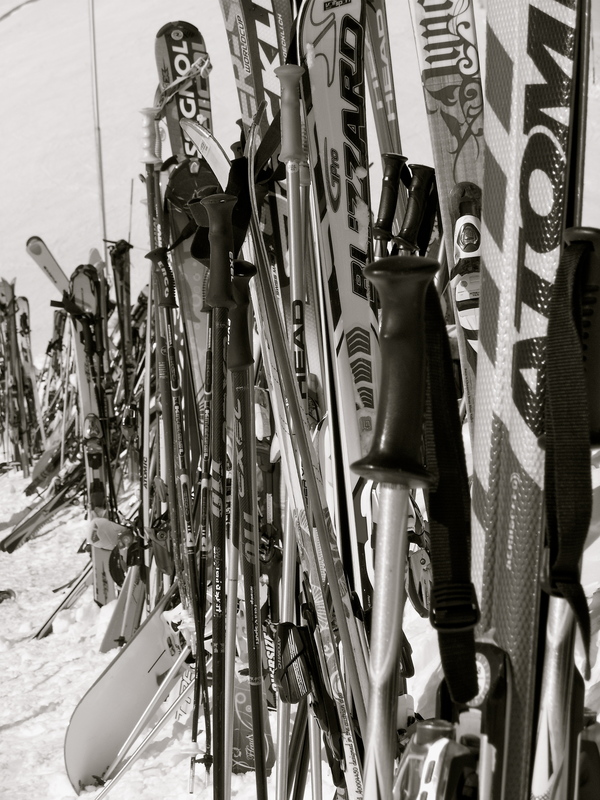 It is a center for alpine outdoor activities including: skiing, snowboarding, heliskiing, paragliding, snowshoeing, mountain climbing, trekking, hiking, mountain biking and everyone’s favorite pastime of warming themselves in cute cafes. All of this activity is not without danger and Mt. Blanc averages 100 fatalities a year and many more severe injuries. 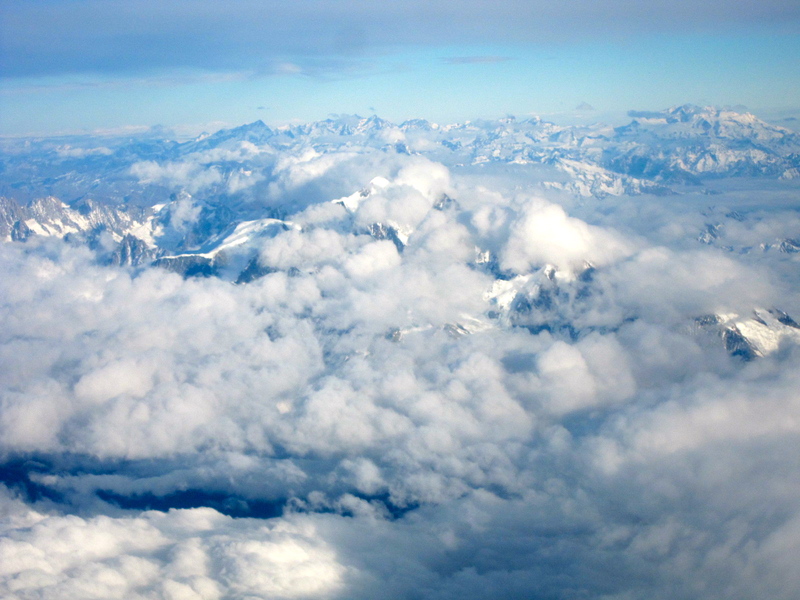 Recently, a Russian couple froze to death while attempting to climb Mt. 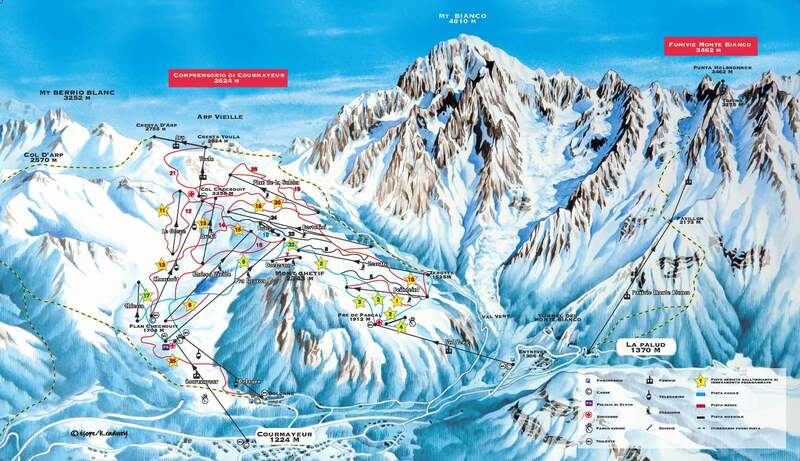 Blanc, a body was found on a black run (he must have snuck in some night skiing), and an avalanche killed a man. Looking at a video of a Mt. 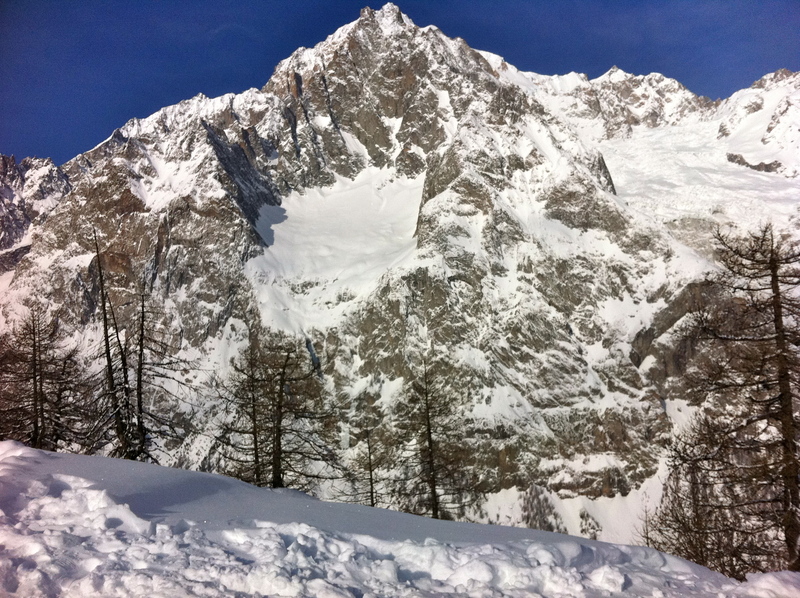 Blanc avalanche on YouTube, helped me to understand their power and danger. 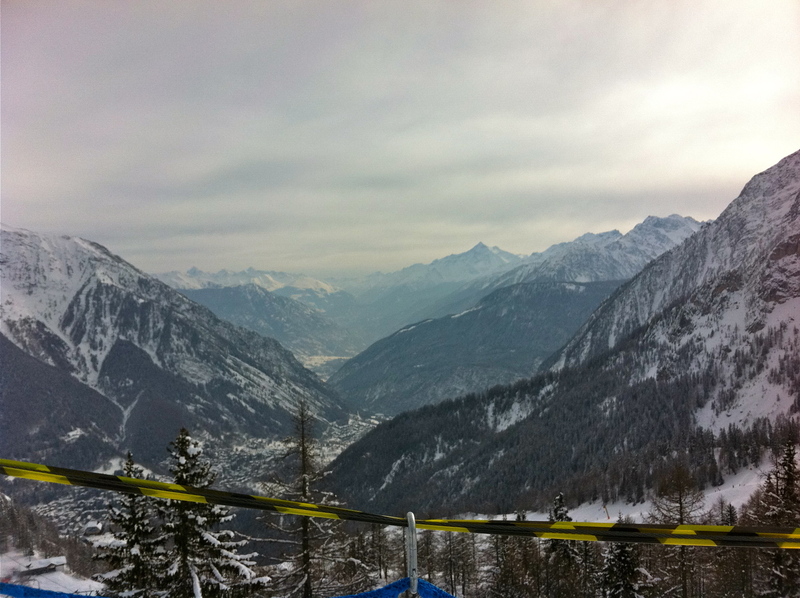 The Aosta Valley, where we spent the weekend, is a paradise for off piste skiing. 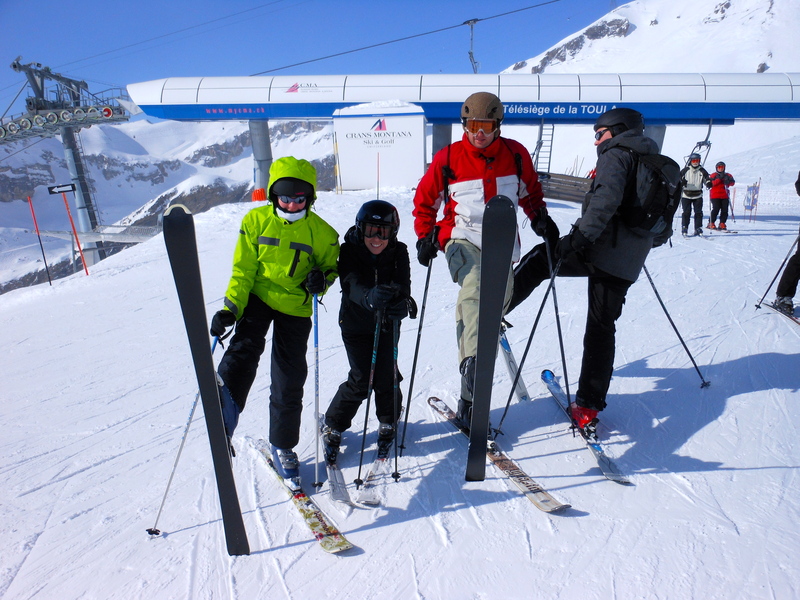 Some of our group went off piste. 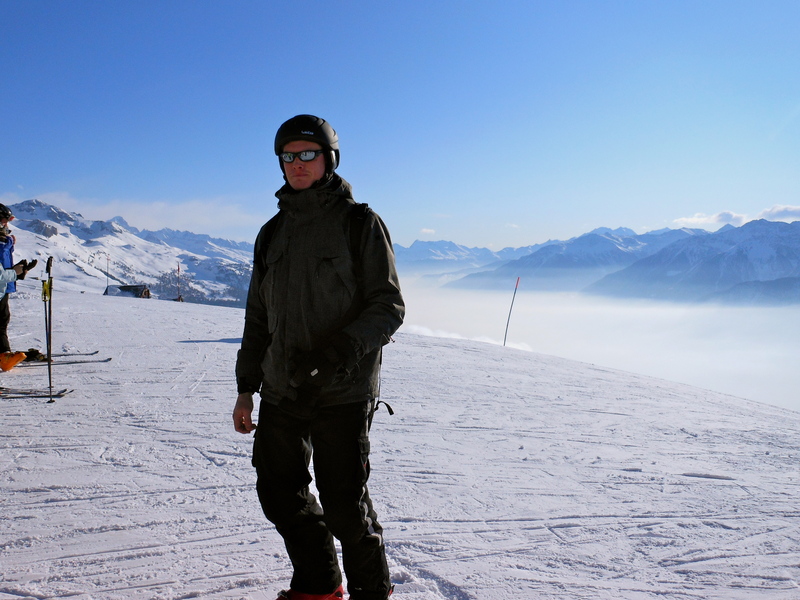 Having skied a whopping three times in the last fifteen years, I was happy to stick to the reds. Please note that these pictures are from the Italian side. Mt. Blanc’s peak is not visible as it is obscured by a lower part of the mountain when viewed from this angle. 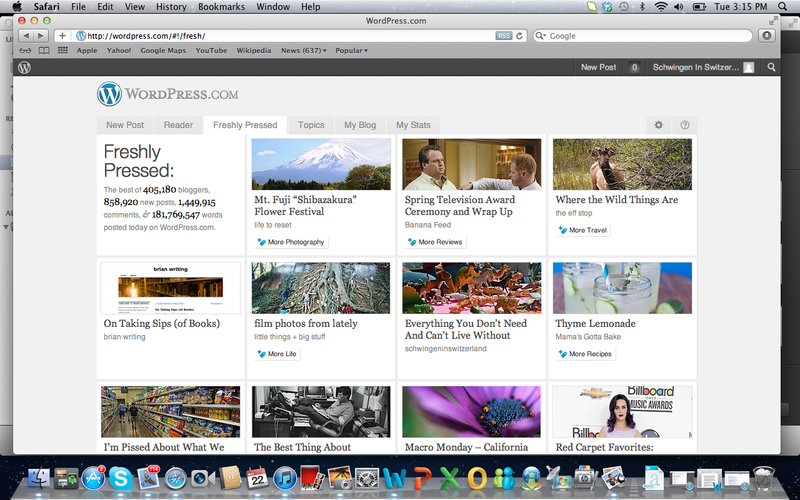 I accidentally changed the blog’s view settings when I tried test out a new view for managing the blog. Big mistake. I won’t be doing any more to mess with it because we’ll be skiing. I’ll have something figured out by the end of the weekend, but probably won’t post tomorrow. Sorry.